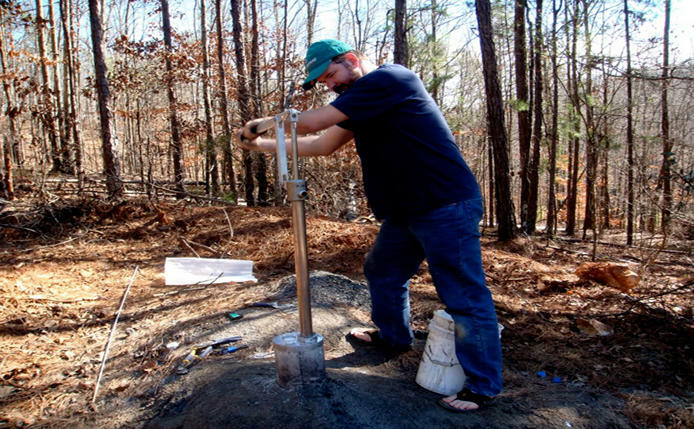 Hand pumps are readily replacing the conventional use of wells to provide a simple solution for providing a hygienic supply of drinking water in rural and suburban environments. They improve the hygienic conditions under which water is drawn off, by eliminating the use of buckets and open vessels, thereby eliminating to a great extent the risk of water contamination. The Afridev hand pump is one of the few recommended by UNICEF as pumps benefiting from its VLOM (Village Level Operation and Management of maintenance) label, in other words, robust pumps that can be fully maintained locally, either by the community members themselves or by a technician that they can call out quickly, and which are also produced locally and selected, managed and maintained by the community. It is designed for heavy-duty use, with a conventional lever action that can serve communities of up to 300 people. Its maximum recommended lift is 45m and the pump is fully corrosion resistant, the bearing bushes being hot dip galvanized and made of special plastics. Alternative stainless steel lined cylinders are also available for aggressive water conditions apart from the mild steel variant. The pump comes with variable handle settings, which makes it possible to adapt to varying groundwater levels at different times. The spout length and pedestal can be customized according to different needs. The assembling and dismantling of the parts are quite effortless since the foot valve fitted on to the pump can be easily retracted using a fishing tool. Rubber centralizers are provided to each connecting rod to prevent internal damage to uPVC pipes, due to corrosion. 225 mm stroke length of the handle in afridev hand pump can provide a water discharge of 1350 liters per hour with an installation depth range between 15 m to 45 m. These hand pumps have quick release eye & hook tool-less ends on connecting rods with rubber centralizers facilitate maintenance and protect the riser pipe against internal wear. Special tools and guided installation manuals are also available with the afridev hand pumps, which makes the assembling and installation very easy. Fulcrum & Rod hanger pins are supported on special grade plastic Bush Bearings, which are easily replaceable. The uPVC riser pipe, cylinder, plunger & foot valves used in the pump are lightweight and inexpensive. Additionally, rubber centralizers are provided to each uPVC pipe to prevent external damage, which further lowers the maintenance and operational costs. Afridev hand pumps manufactured at Aakash International have a few special features that distinguish them from other pumps available in the market. A choice of Eye & hook connecting rod or threaded connecting rod is provided. They are easy to instate and can be accomplished even by women mechanics in villages. Additionally, quick release Eye & Hook tool-less ends on Connecting Rods with rubber Centralizers facilitate maintenance and protect the riser pipe against internal wear. The tools for installation and maintenance, along with an interactive user manual are provided along with the hand pump. 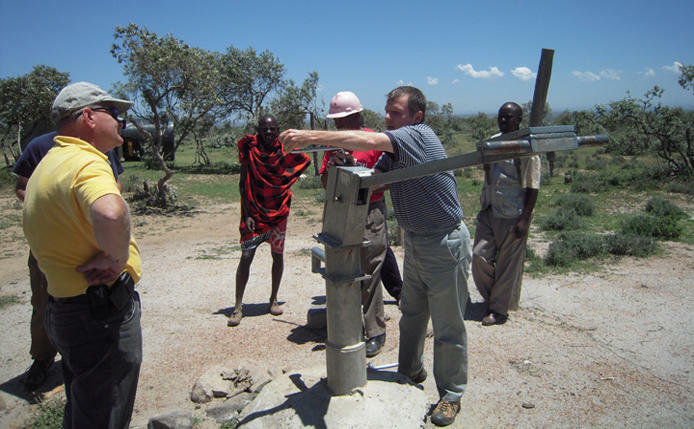 The unique features of the Afridev hand pump render it a special quality which sets it apart from the conventional manual hand pumps as it can be quite easily assembled and installed and doesn’t need dismantling of all the parts for maintenance or replacing. Also, it cuts out on the high maintenance costs owing to the noncorrosive nature of the connecting rods. The tools for installation further eases out the usage. 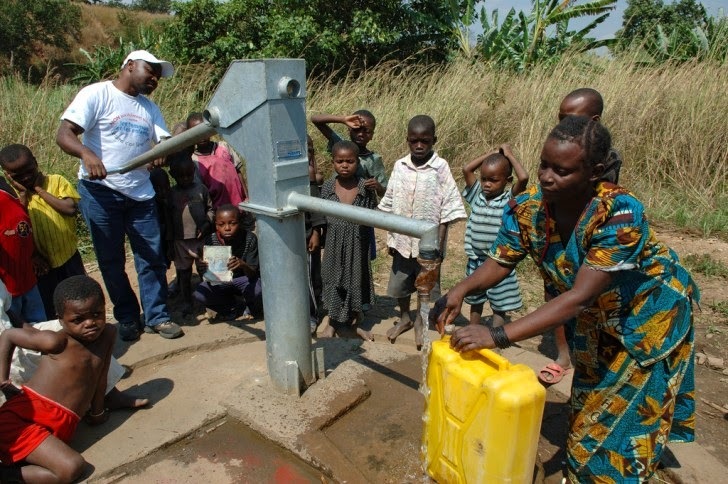 The afridev hand pump thus eliminates the difficulties and complexities associated with machinery and give it a user-friendly quality, while solving the problem of hygienic drinking water supply in urban and suburban areas.